A recent analysis showed that Scotland is one of the higher per capita emitters. TheScottish Government wishes to reduce its net Greenhouse gas emissions and move towards a low-carbon economy in a sustainable way and it passed the Climate Change (Scotland) Act in 2009, committing the country to a target for reduction of GHG emissions of 42% by 2020 and 80% by 2050. These targets are amongst the highest in the world. Managing the land can help to reduce net Greenhouse Gas emissions by storing CO2 in the soil and vegetation. 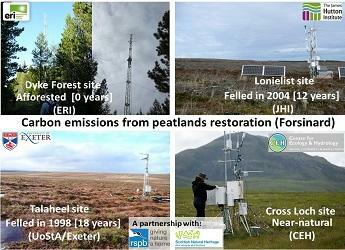 The restoration of degraded peatlands is a cost-effective way of reducing C losses and sequestering CO2 from the atmosphere. Similarly, expanding the area of woodland may help store C in landscape. We will focus on the impacts of land use, including the agricultural intensification of extensive/upland soils and the management of semi-natural ecosystems such as peatlands and moorlands on soil carbon stocks and greenhouse gas dynamics and particularly on the impacts of forest-to-bog peatland restoration and moorland management on long-term rates of C sequestration.